Property VS Shares - What's The Better Investment? 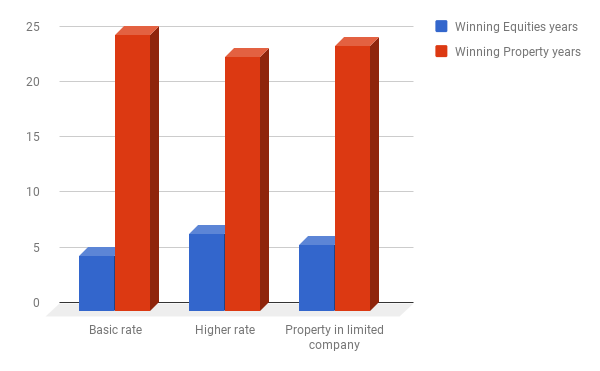 Property VS Shares – Which Is The Better Investment? Property VS Shares – the two most popular investment classes in the UK. Which over the long-term produces the greatest returns? Property can be leveraged to improve your return, rented out or developed. Yet investment ‘experts’ claim stocks and shares (equities) outperform property over the long-term, take less time to manage and can be held in an ISA. Is property your key to instant riches? Or is not worth the extra effort and likely to under-perform against equities in the long term? In order to seek the answers, I began on my own mini financial odyssey, starting by diving into financial books, spending time with successful investors and eventually opening accounts and buying shares. Whilst at the same time, I attended property seminars and went on a 12-month property investing mentorship before personally raising finance, purchasing, refurbishing and letting out two buy-2-lets. As the experience started to unfold I began building data on both options in order to compare them at a later date. Starting with equities I discovered the most efficient way to invest was through cheap low-cost funds (a bundle of shares around a general theme e.g. the FTSE 100 or Technology). These could be purchased and held extremely cheaply and over the long-term typically out-performed those who picked individual stocks and attempted to time the market (including most of the people paid to do it). 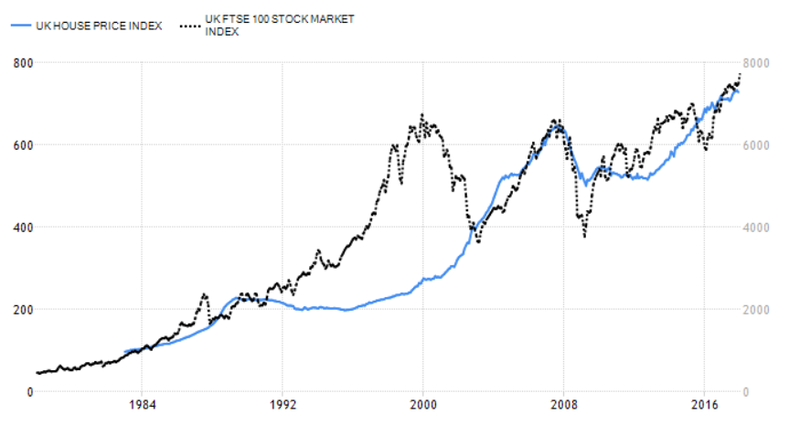 From my own research I discovered long-term equities generally produced returns of 10.99% per year (1986-2017 average FTSE All Share Total Return). This could be stretched higher if you did find one of the few investment funds that had been proven to beat the market over the long-term. Equities could also be held in an ISA meaning you can bank huge profits and pay zero tax on your gains, unlike property which is hit with at least 28% tax. This difference makes a huge impact over the long term. The biggest difference of all came from those who bought and sold odd shares on a whim or a tip and those who quietly accumulated huge ISA balances over the long term by investing monthly in a series of funds and not changing strategy, no matter what. So, I too began quietly investing in an ISA – but what about property investing? Property at the time in my local town was absolutely booming and the returns could further be boosted by purchasing with a mortgage and supplemented with rental income. 20% a year return for doing “nothing” seemed to good to be true and my masterplan was quickly put to bed when I met with property investors from the midlands and north who claimed properties they owned hadn’t increased in value in over 10 years. Whilst I thought property was booming, infact I was living in a micro bubble unaware of the greater econmical market. 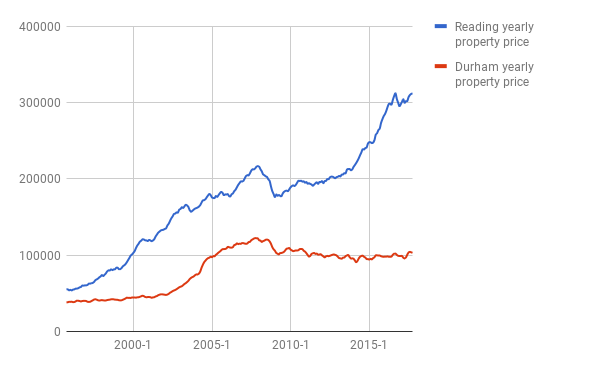 You can see the difference in property growth was huge, in particular since 2007 whilst Reading had taken off, Durham had barely moved. The impact over the long-run compounded meaning those in Reading saw an almost 300% extra growth compared to Durham which would make a massive difference to the families net worth and retirement options. What’s even more shocking for me is that Durham property prices are still 16% cheaper in late 2017 than they were a whopping ten years ago in 2007…the financial crisis lives on. So clearly the potential for a property investment was highly dependant on it’s location and therefore comparing the entire house price index against the FTSE was meaningless unless you planned on purchasing a property in every town in the UK! So what about rental income? This was where the sophisticated investor’s and the ‘invest and hope’ investors began to separate. A sophisticated investor would look for rental yields of 8-10% and purchase with an interest only mortgage – essentially purchasing the property as an income source not a capital appreciating investment. They’d also develop the property to improve its value and purchase at a price below the market – locking in a profit from day 1. Compare this to the invest and hope strategy of buying somewhere close, not looking at the area’s potential and often paying more than necessary. Another essential difference was that the successful property investors almost always purchased with interest only mortgages to benefit from ‘leverage’. By using a mortgage the cost of purchasing the asset became significantly less than it’s value e.g. a £100,000 property would cost you just £32,000 (assuming 25% mortgage, £5k refurb, and 2k legal costs) rather than the full £100,000. If the property then increased over two years to £120,000, upon selling the property you’d receive £45,000 (£120,000 – 75k mortgage), a whopping 40.6% return on cash invested (ROCE), all while receiving rental income. Investor’s also purchased with interest only mortgages to create a surplus of rent enabling the property to become and income producing asset. However unlike equities when investing myself I found the time input was significantly higher both in the onset and on-going plus there was a bunch of extra costs I never knew existed. The property couldn’t be held in an ISA to shelter it from tax and upon research like the investment experts advised the average property increase at 6.18% per year (1986-2017 average house price increase) was significantly lower than equities 10.99%. Shortly after I finished purchasing the second property George Osborne rolled out a budget raining the hammer down on property investors. For some time they’d been presented negatively in the press and this was offered both an option to capture votes from the younger generation and increase tax revenues at the same time. The budget increased the tax on selling a property to 8%, increased stamp duty for investors by 3% and banned investors from claiming many expenses (including interest payable on mortgages). This made headlines such as ‘buy-2-let is dead’ and ‘house price crash due’ and furthermore it made my comparison even more difficult…damn it, George! At this point I was no clearer which produced the greater returns, so I set out to build the first financial model accurately comparing property investing over equity investing including all the attributes missed off by financial reporters (benefits of leverage, extra time and costs spent on property, tax implications, recent government changes, impact of fees on index investing, inflation rates etc etc). I began with the historical data a typical Independent Financial Adviser (IFA) would use taking national averages since 1986 to compute everything from equities performance to interest rates. Shocked by the assumptions? Mortgage interest rate of 7.33% & annual property increase of 6.18? These are long-term averages since 1986 and are what an IFA would typically use when creating a comparison against equities. 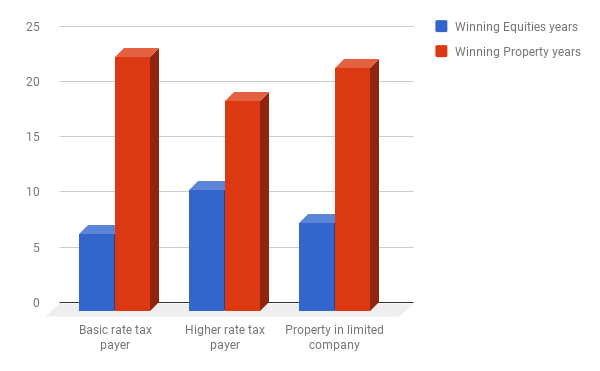 We can see the data an IFA would use does show equities clearly outperform property for both basic & higher rate tax payers and investors who purchase property within a limited company. However what they’d miss out is that sophisticated property investor’s would never invest at these rates. Aiming instead for significantly higher rental yield’s (typically 8%), creating initial value uplifts through refurb’s and negotiation. Furthermore if we look at the time it took mortgage rates to drop to the current rate of 0.5% and work backwards they’ll likely pay a much lower mortgage interest rate over the next 30 years than the past 30 years. So taking this into consideration I created another model. We can see here, the property has burst onto the scene for everyone apart from the higher rate taxpayers. Showcasing how the sophisticated property investors have a huge advantage over the invest and hope investors. What I’d missed is that your average equity investor likely over pays for someone to manage his or her financial affairs increasing the fees they’d pay and having investments that lag behind the average so in order to realistically compare the two we needed to take this into consideration. Finally I increased equity fees to 1.5% (still much lower than most pay) and reduced equities return to 7.5%. You can see this has had a massive impact on the performance – now putting property ahead for everyone (even the higher rate tax payers). In this final example the basic rate property investor would end up with £529,712 compared to his equity investing friend left with just £186,748. 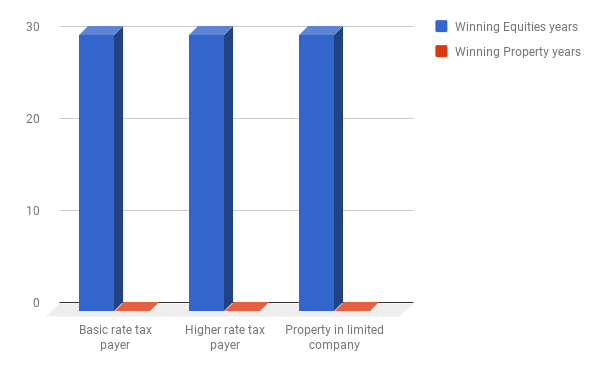 So it’s apparent that the winner is the educated investor whether they specialise in property or equities. An educated index investor will out perform the average property investor over the long-run whilst the sophisticated property investor will outperform your average equity investor. Damn it Sam! Just tell me what to do! In order to compare for your own sake I recommended you take into consideration your starting investment, income level, stage in life and time commitment (property investing takes a lot longer).